Okay. I think we're scraping the bottom of the barrel with this post. The Cracker Barrel Cheese barrel that is. Heh, heh, heh. 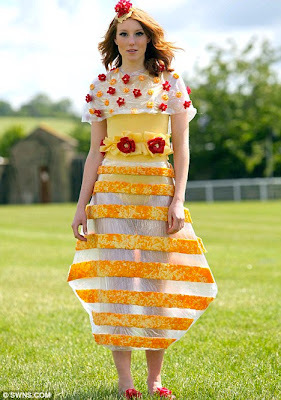 So I go looking for a subject for today's post and I come across a story about a bunch of college kids who designed and made dresses out of cheese. Yeah, that's right. I guess these dresses serve two purposes. It's something to wear to work. And you don't have to worry if you forget your lunch or if you feel a little peckish in the middle of the afternoon. Mmmm...yummy. The dress looks nice too. The design students at Bath Spa University in Britain say they were inspired by lady GaGa and her meat dress. I guess they thought her dress was "well done" and wanted to outdo her. It took them over 1,000 hours and a tonne of cheese to create 5 outfits. Pretty gouda, eh? I'm thinking of getting into the dress-in-food business myself. I've researched things carefully and I'm about ready to launch a new line of ladies undergarments. 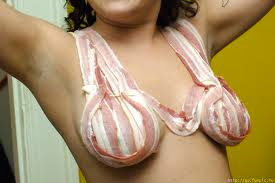 I thought I'd start with bacon bras. If all goes well I thought I'd then get into bacon thongs. Yeah. Kinda sizzles don't ya think? I like the bacon bra, just thinkin' out loud here, buy might not want to lay outside in the sun in that thing might get up with a cooked bacon bra, and forget about the baby oil, who needs it when you have bacon grease. You see, there's more to this bacon bra than meets the eye. Sunscreen! Hmm. Dunno. I gots a sensitive nose and all I can "see" (aka smell) is rancid meat and funky cheese. Let's hope they didn't use any swiss that stuff stinks! Unless you like eau de stinky feet. I don't know if that works for clothing but it is a great diet plan. I have officially lost my appetite for cheese and ....especially...bacon. One strip of bacon at a time. You can tell the Swiss cheese dresses from the others. They've got holes in them. I would worry about being chased by a pack of hungry yuppies (do they still call them that?) carrying a case of Chardonnay and loaves of sourdough. But Jayne it'd be nice to be wanted wouldn't it? Nicky needs to see this. You know she loves all things cheesy! That bacon bra looks a little greasy to me. Hey, aren't those cheese rosettes supposed to be positioned on her breasts? Oh, wait ... she has no breasts. Never mind. Yeah, cheese and bacon - it's high cholesterol fashion. I wonder if Nicky would wear an outfit like this? Either that or she's way older than she looks. And I'll do anything to break into the modelling business, so I'm prepared to wear said bacon bra. I MUST HAVE CHEESE DRESS!!!!!!!!!!!!!!! I like your sense of adventure. Can I interest you in a thong? I knew you would. Havarti or brie? I must have bacon breasts. Er, I mean, yeah...um...going to leave rest of comment alone and step away slowly. Personally I think you'd look a little funny with bacon breasts but, hey, to each his own.